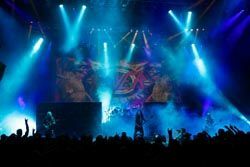 NEW YORK, NY--Unlimited Visibility Lighting Design (UVLD) brought its media and media-management expertise to the concert-touring arena with Cameron Yeary, consulting on the dual Slayer and Marilyn Manson tour. Yeary teamed with lighting designers Jason Cain and Sonny Satterfield, with the Slayer and Marilyn Manson tours respectively, as the bands set out on a double-headlining tour of the US this summer. "They brought me in to help merge the two shows together as they moved from small venues and European festivals to large amphitheaters," says Yeary. "My job was to assist with the equipment interface and make the transition as seamless as possible. Combining equipment and managing media for a show now twice the size was quite a challenge." According to Yeary, Slayer had been deploying High End Systems' DL.2 digital lights and a Catalyst system while Marilyn Manson favored Coolux's Pandora's Box. "I had to figure out a way to run Catalyst through Pandora's Box as an input and to add the cameras Slayer requested," Yeary explains. "We needed to operate five lipstick cameras and two front of house cameras through Pandora's Box and mix the live cameras on top of Catalyst." In addition, the designers had to be capable of controlling, from front of house, seven cameras and their own media and content live. "That was a pretty cool feat," Yeary notes. "I had to make sure all of those elements would be able to come together in time for the show. It was definitely fun to see cameras come into a show that been programmed with nothing but prerecorded media; now the tour was able to use live content." Yeary was also tasked with re-encoding media and checking files as they were received from production. "There were drastic differences between the two bands in terms of content and technology," he notes. "Slayer's content was very literal while Marilyn Manson's was more theatrical. It was also interesting to see the two media systems combined, one Mac and one PC, each requiring drastic different codec types."